The Don’s Mobile Glass Christmas Shopping Tour for Children is our most cherished and unforgettable annual event. For 43 years, we have carried on the simple tradition of giving back during the holiday season by treating the children of our community to an evening of Christmas shopping. Children are selected by teachers and staff from several of the Modesto City School District elementary schools and the Salvation Army Red Shield. With the help of countless individual volunteers and those from organizations like the Modesto Kiwanis Club, The High School Key Clubs of Modesto High School, Downey, Johansen, Beyer, and Gregori, Capax-Giddings, Corby & Hynes, Boyett Petroleum, Wardens, Enterprise and others, children are able to shop for much needed winter clothes, new shoes, and toys. After shopping, dinner is hosted by The Century in historic downtown Modesto. There, each child is able to choose a brand-new book donated by the McHenry Barnes & Noble store, followed by a choir performance by the Downey High School Madrigals and Nightingales Choir. Just when we think the evening is over, sleigh bells ring and children are overjoyed by the entrance of Santa Claus himself to give one more gift for every child. To date, the Don’s Mobile Glass Christmas Shopping Tour has successfully taken 3,958 children shopping. 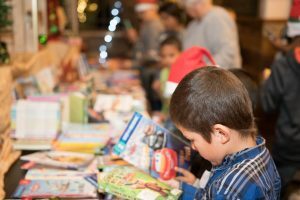 We could not make this event happen without our many volunteer sponsors, from the donations received across the community, and the generous contribution from stores like Barnes & Noble, JCPenney and Sears of Vintage Faire Mall in Modesto! To all involved, Thank You! Please take a moment to explore the photos taken at El Vista Elementary School and more!! All photos can be downloaded by clicking here. With Special Thanks to: Mindless Imagination Studios, El Vista Elementary, Tuolumne Elementary, Martone Elementary, Robertson Road Elementary, Shackelford Elementary, Orville Wright Elementary, and The Salvation Army Red Shield. To learn more about the history of Don’s Mobile Glass and the Christmas Shopping Tour, watch our full documentary here.